Not even I can deny the convenience of opening a can of pulses, rinsing them under water, and having them ready to use. It’s what I call fast food. The type we should all be eating. 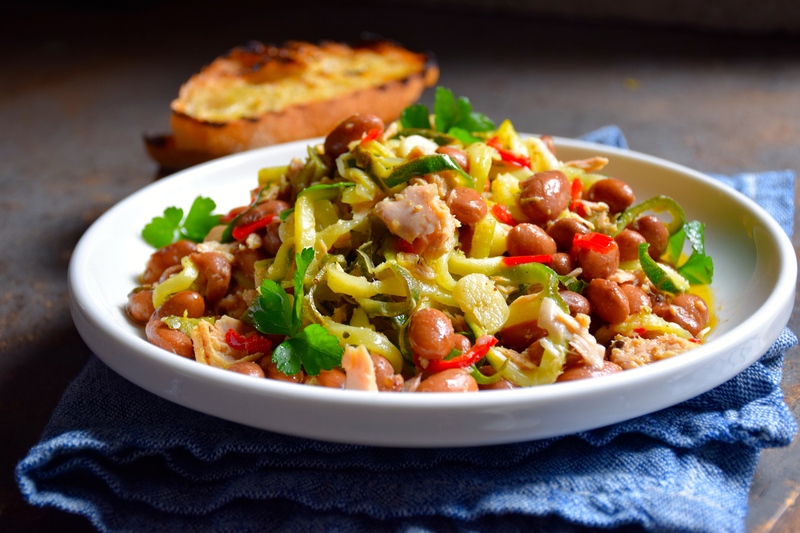 Whether it’s Borlotti beans, cannellini beans or chickpeas (which by the way, the later two make a great substitute to the borlotti in this salad) the fast access to a pulse that would usually need to be soaked over night and cooked for 30 minutes or longer just can’t be denied. So I’m happy to use this short cut when I need fast feeding. This recipe proves that fast food can be healthy. The spirals of zucchini (which look like pasta in this shot) are my favourite element to the salad. I’m grateful for my spirelli cutter, which makes quick work (and beautiful spirals of zucchini). If you aren’t a convert yet, you can use a peeler, a mandolin, do the old fashioned way and use a knife, or – though it’s not as pretty – as a last resort, just grate the zucchini. A large glug of extra virgin olive oil (don’t be shy here, it’s so good for you) is heated lightly for the garlic and chilli to gently cook in. In goes the zucchini, a quick swizzle in the pan before turning off the heat and adding the drained tuna, lemon zest (wax-free if you can), juice and rinsed borlotti beans. If you’re in the middle of winter (like I am) you’d eat it warm, but if you’re beating the heat of summer, let it cool and eat it cold – either way, it’s just so good! Each time I walk past my bowl of organic homegrown lemons, sitting by the window sill, I think of how lucky I am to have wax-free lemons picked from my own tree. I wonder why all store-bought lemons can’t be wax-free. Surely everyone deserves wax-free lemons. If you don’t have a lemon tree, find someone who does, or, buy organic wax-free lemons, you will benefit immensely. I’ll never tire of the classic combination of garlic, chilli, lemon and tuna. I don’t think you will either. It’s so Italian. It’s so simplistic. It’s just right. And really, any food this delicious that can be made in ten minutes deserves a little attention. Prepare the zucchini into thin long strips by your preferred method of a spirelli cutter, mandolin, knife or grater. Zest the lemon and juice half of it. Warm the extra virgin olive oil in a medium fry pan, add the garlic and chilli, and cook gently for 2 minutes. Add the zucchini, sea salt and cracked pepper, cook gently for 1-2 minutes. 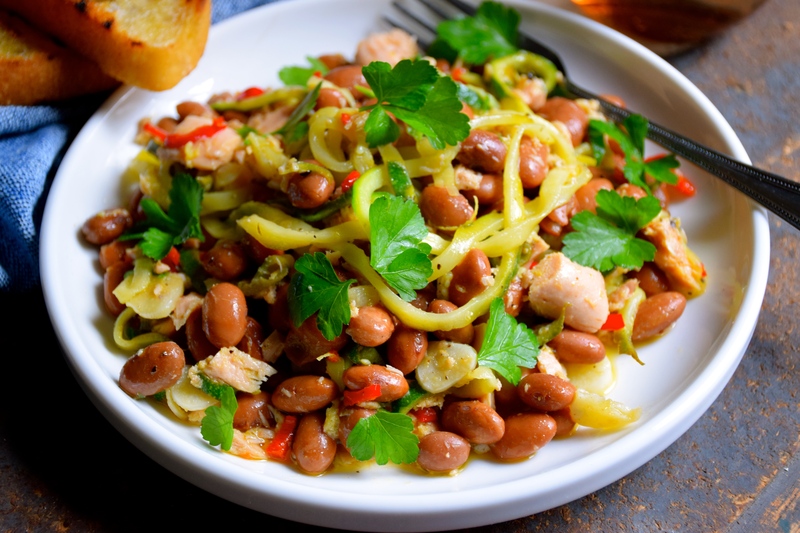 Turn off the heat, add the drained tuna, drained borlotti beans, lemon zest and juice, toss lightly to combine. Serve warm scattered with parsley and if so desired grilled bread. Thanks Naina, it’s one of my fast favourites of the moment. This is fabulous! 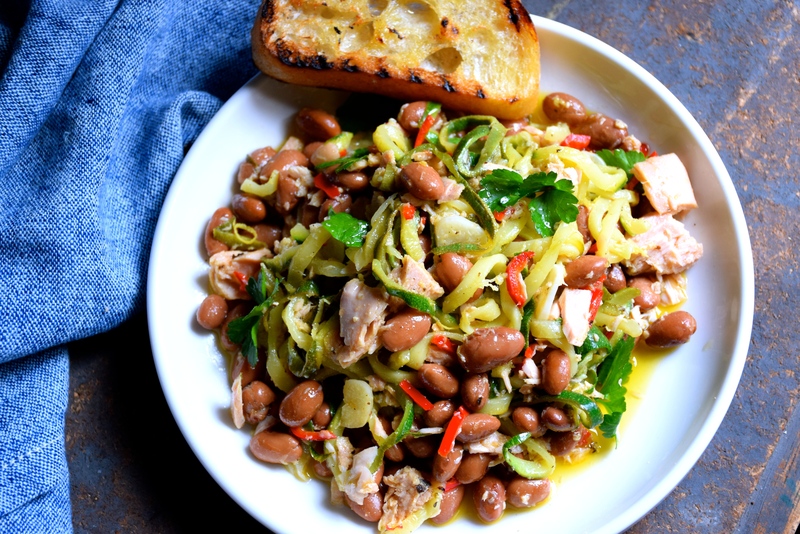 Like a bean substitute for pasta with tuna! If you’ve ever seen my blog, I LOVE beans, and canned beans are a good quality product. Definitely the fastest food I eat as well! Thank goodness for beans in a can hey!